Hi, I hope my couple readers will enjoy your site, so this is a link. 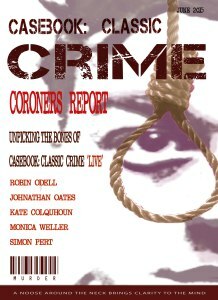 A free electronic post conference edition of Casebook: Classic Crime magazine. This issue: new writing by Kate Colquhoun, author of the acclaimed ‘Did she kill him?‘ and the prolific king of crime Jonathan Oates. Frogg Moody explains why he needed to hold a crime conference, Simon Pert, author of ‘Vendetta‘, gives us a ‘witness report‘ and Monica Weller , author of ‘Ruth Ellis – my sister’s secret life‘, gives us a speakers view of the classic crime conference. details of a free guided tour of the ‘Forensics‘ exhibition.